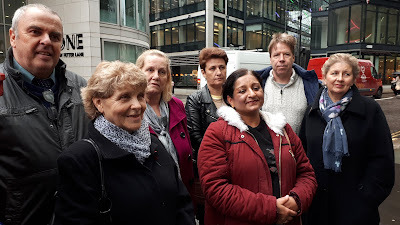 It's very difficult to try to even understand, let alone explain what sort of day this must have been for the former Subpostmasters who turned up to court today. Some are pictured above. I reckon twelve made it in total. Nigel and Sue (above) left their home at half past midnight, driving from the Lizard in Cornwall to Basingstoke, arriving at 6am, having breakfast and then getting the train into London so they could be in court for the start of the case. Karen Wilson (also above) came wearing her late husband's scarf under her jacket, with his ashes in her bag. He was one of the JFSA's leading lights in the early days. He succumbed to cancer two years ago. "I don't want him to be a victim." Karen said to me today. "I don't want people to think the Post Office killed him. But what they did contributed to his death. He should have been enjoying his retirement..."
This court case, for many hundreds of people, is a Big Deal. To the legal teams who are fighting it out - it's just business. And it is my job to report the business of this trial. This is the first of at least two (the second confirmed trial - the Horizon Issues trial will take place in March next year). It is called the Common Issues trial, and it is based on 23 common issues identified by the 560-odd claimants which are pertinent to their situations. (I must get an agreed final total of the number of claimants - the judge recently said "around 600", Freeths gave out 561 as their final number a while back, and today the Post Office QC said it was 557). I have a list of those Common Issues which I will upload as soon as I can. 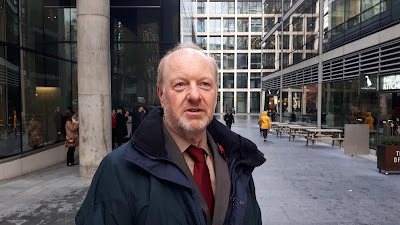 This morning was given over to the JFSA's dashing QC Patrick Green, who is best known for his unobtrusive role in the court case which led to a ruling which ensured Brexit would get a final parliamentary vote. He held forth for the entire 2.5 hour session, punctuated by interjections from the judge (the Honourable Mr Justice Fraser) and a brief break to aid the fingers of the stenographers. Mr Green's theme appeared to be that the relationship between the Post Office and individual Subpostmaster had such a massive imbalance of power that the Subpostmaster (SPMR) contract was unfair in law, partly because of the way it was written, partly because so few SPMRs understood its import (or indeed ever saw it) and partly because of the way it was implemented. He was seeking to make the point that the imbalance of power didn't just exist in terms of the contract, but in terms of access to information, access to the Horizon IT accounting system and on a practical level in terms of what the Post Office could do to an SPMR set against what the SPMR could ever do to an SPMR. His speech was particularly interesting when it brought to light two pieces of evidence, both internal Post Office memos. These had only come to light as a result of the disclosure rules which govern civil trials. The first memo was written by a Post Office manager who visited one of the lead claimants, Pam Stubbs, whilst she was having terrible, inexplicable trouble with her Horizon IT system at her Barkham Post Office in Berkshire. Pam was being held liable for losses which ran into the thousands. Losses which had only started when she moved into a temporary cabin in her Post Office's car park whilst her branch was being refurbished. The Post Office manager notes Mrs Stubbs' problems with Horizon, mentioning she had to reboot it 25 times one morning. He makes it absolutely clear in the memo that Horizon was the source of the problems she was having. Yet she was never told this, and she was held liable for the discrepancies which came up on her Horizon screen. This, said Patrick Green, directly contradicts the Post Office's assertion (made in its generic defence to the claim) that no claimant had suffered problems in their branch as a result of Horizon. The second piece of evidence was a document about a system-wide Horizon error in 2012 which was causing losses in branches. This was discussed on internal email by a group of Post Office employees. The author of the email provides three option for dealing with the error, which included getting Fujitsu to go into individual Subpostmaster branches and changing the accounts without their knowledge. It was discussed as a matter of fact, not conjecture (all three options were given impact and risk assessments) and the email makes it quite plain the Post Office had the power to pretty much do what it liked to individual branch accounts, should it choose to do so. The afternoon session was given over to the extremely capable David Cavender QC who took us through his skeleton argument from 2pm to 4.30pm - again punctuated by queries from the judge and a short break for the stenographers' fingers. The Post Office's point appears to be that it has a contractual obligation under the terms of the Subpostmasters Contract (SPMC) and it has always stuck to that obligation. To the letter. Inventing implied terms of obligation and responsibility to a contract, just because the claimants fancy it to have some, is, at best, fanciful. Postmasters are agents, the Post Office is the principal, and both go into a business relationship with their eyes open - the basis of which is the SPMC. Very early on he made the point: "What the claimants are trying to do is water down the agency/principle relationship (almost to vanishing point) to say it is basically marginal." "The Subpostmaster is responsible for all losses caused through his own negligence, carelessness or error, and also for losses of all kinds caused by his Assistants. Deficiencies due to such losses must be made good without delay." ie if something went missing in a branch and the SPMR had the right to go "not my problem, guv" - the whole business model would fall apart. Another argument was the subject of a considerable amount of debate with the judge. Mr Cavender said that at no stage would the Post Office ever hold an SPMR responsible for a discrepancy caused by the Horizon IT system. He said S12.12 of the SPMR contract is only interested in the SPMRs' "own negligence, carelessness or error". A Horizon error was not an SPMR error, so the SPMR would never be pursued for a Horizon error under S12.12. Are you with me so far? Good - because here is the kicker. 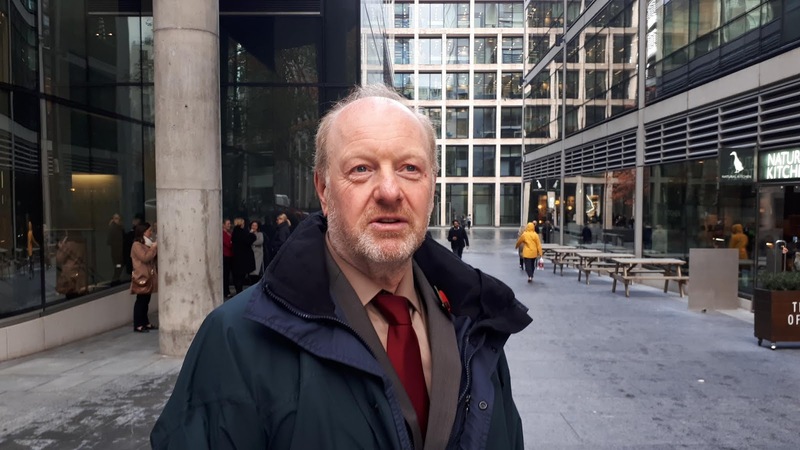 Mr Cavender told the judge that based on Horizon's general reliability, if Horizon reported a branch dispcrepancy, it was perfectly reasonable to infer that the accounting discrepancy existed, because of Horizon's general reliability. Essentially any Horizon discrepancy became fact by Horizon's reporting of it, based on its general reliability. Not only did it become fact, it became the SPMR's problem to deal with, because the way in which it was presented to the SPMR, who was forced to accept it as a debt to the Post Office. It was then down to the SPMR to prove it wasn't their error or negligence which caused it. Unsurprisingly the judge had questions. He wanted to get a hypothetical principle understood, which was that if "Horizon says x, x being a shortfall, then there is a shortfall." "your ‘gateway’ [to creating a burden of proof on the SPMR to identify the source of the loss] is a step that’s reached after you reach an inference that Horizon is reliable." Again Mr Cavender concurred. There was some discussion about the point at which and how Horizon produces "evidence" that there is no computer error and the fact of a discrepancy. After consulting his colleagues on the benches behind him Mr Cavender says the burden is on the Post Office. The judge then invites Mr Cavender to read transcript of what just happened in court carefully later as he’s not sure it makes a lot of sense. Mr Cavender: "If my Lord reads my opening submission…." Judge Fraser: "There is no need to use the conditional. I’ve read it twice. And I will read it again." The argument then moved on to discussions as to whether the contract between SPMRs and the Post Office was "relational" or just a standard business contract. This is important as a relational contract is something "whose effect is based upon a relationship of trust between the parties to which it pertains. The explicit terms of the contract are just an outline as there are implicit terms and understandings which determine the behaviour of the parties." The Post Office seems to be very keen to make sure no one thinks the SPMC is a relational contract and that even if it is, a relational contract has very narrow terms. There was some push back from the judge on this. He felt a relational contract might imply general terms of good faith. This led to a discussion during which both Mr Cavender and the judge entered a lengthy discussion based on what the Yam Seng ruling about relational contracts first said, and then meant. “the Claimants' case is all at sea as to what they are alleging at any given time.” and “This is an extraordinary case... in that we don’t know what the other side is saying." and then it became a discussion of logistics, the upshot of which the cross-examinations of Lead Claimants promises to be lively. We have finally been told who all the Lead Claimants are, by the way. They are: Alan Bates, Pamela Stubbs, Mohammad Sabir, Naushad Abdulla, Elizabeth Stockdale and Louise Dar. He will be standing up in court at 10.30am tomorrow. Just by-the-by, before proceedings started today I saw a man on his own who clearly had something to do with the case, but who didn't appear to know anybody. I approached him at lunchtime and established he was a claimant Subpostmaster. After the day was over I introduced myself properly and asked if I could take his details. He didn't want his real name published, so let's call him Parvinder. He seemed like a quiet, measured and intelligent man. He's also got quite a strong South East London accent, as befits a former Subpostmaster from that part of the world. This is Parvinder's tale from memory, as he tells it. I have no documentation to back up what he says. I took it at face value. Parvinder ran a successful Post Office for 10 years from 1990. His family helped out and he trusted them. In 2001, after the roll-out of Horizon, Parvinder's Post Office was found to have a £27,700 discrepancy. He was suspended and investigated. He agreed he would pay the Post Office £27,700. He borrowed the money from his family and handed over a cheque. For some reason, the Post Office decided to prosecute him for theft. On computer evidence and legal advice, he pleaded guilty and was sent to prison. He became a shell of the man he was. He had to wear a tag after he left prison, which stopped him from leaving the house before a certain time - yet he was used to getting up to be at his Post Office to deal with the papers at 5am. His family picked up the running of the branch, and he helped out. In 2005 he became a cab driver for Addison Lee. Nowadays he does voluntary and social work. Parvinder's career started as a bank teller at Nat West. He handled money all his life. He worked and saved to get himself into a position to own his own Post Office. 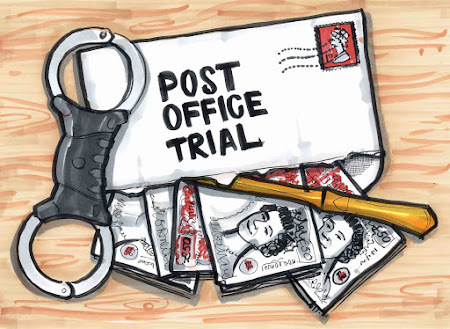 He knew nothing about the JFSA or the fact other Subpostmasters appeared to be having similar problems to him. He put it behind him until he saw the BBC's Panorama programme on the subject in 2015. After watching it, he wrote to Paula Vennells, the Chief Executive of the Post Office, saying that what happened to him must have been as a result of a Horizon error. He could see no other reason for it. He sent her all the evidence he had, but did not demand she re-open or review his case. He only asked for an apology for what the Post Office put him through. Parvinder had missed the mediation scheme and the parliamentary debates and all the hoo-ha about this story until a Subpostmaster friend of his mentioned there was a class action starting against the Post Office. He signed up. I watched him in court today, evidently reliving certain memories which had been buried for while. Afterwards I asked him if he felt pressured into pleading guilty to theft in order to reduce his likely sentence. He said he did. I asked him if he would plead guilty again, knowing what he does now. He said he wouldn't. I asked him if he felt the legal profession was negliegent or culpable as the Post Office might have been in terms of how he was treated and what happened to him. He nodded. These m'lud, might be leading questions, but they are the conclusions I've heard many other claimant Subpostmasters come to, unprompted, many times before. Parvinder's coming back tomorrow. He seems like a good bloke. I have no idea what all this means to him. No idea.